It’s almost impossible to talk about Ben Reubeni without diving into the influence that his father had on him, both as an entrepreneur and a fisherman. For that reason, we decided to summarize that relationship by talking about: The 6 most important lessons a father can teach his son. Toronto’s CN Tower became the world’s tallest free-standing structure. It’s also the year that Ben Reubeni, the 4 year old son of a machinist and fishing enthusiast, learned that for every problem there are at least 2 solutions and one opportunity! At a time when work was scarce and men were forced to dabble in all kinds of trades to make ends meet, Ben’s father, Abraham, worked in the business of repairing cars. He worked long hard hours in his driveway during the day, and delivered pizza at night to provide for his young family. Eventually, Abraham was able to save up enough to buy a single machine and start his own milling business. He then borrowed from his parents and in-laws to open “AM Machining”, which in the beginning was nothing more than 100 ft² corner in a building occupied by another business. Abraham experienced his fair share of struggle in the beginning, but within six months was able to pay off his loans. Fast forwarding another few years, he grew his business even more by hiring several tradesmen. The company finally began to take shape, and all the hard work paid off. Ben grew up spending weekends, holidays, summers, and finally years in his father’s small, but rapidly growing factory. While Ben’s trade skills were being nurtured and refined on the plant floor, little did Abraham know that his passion for fishing would influence his young son to become an inventor of a Center Pin Reel. Each spring Ben watched his dad arrange his tackle and gear for his soul trips to Rainbow Trout Country, and was often disappointed to hear his Dad tell him, “Ben you’re not heavy enough to stand in the river yet.” Finally, Ben turned 15. At 120 lbs soaking wet, his dad decided it was time to take his son to the river. Fast forwarding 10 years, Ben is again standing in the river in Thornbury, Ontario albeit much bigger, stronger, and wiser. He was determined to learn the secrets and techniques he witnessed the local anglers doing. Still using a Spinning Reel and a rather short rod, Ben was still making some rookie mistakes. It wasn’t long before Ben got his line tangled up with another anglers. While the two of them untangled, Ben had a chance to inquire about the gentleman’s 13′ noodle rod and a new style of MacGyver’d Fly Reel that Ben hadn’t seen before. Due to the insufficient length of his rod, when Ben got a fish hooked up there wasn’t enough flex in the rod to accommodate the tension put on his 6lb leader line by the fish. Current, headshakes and the sheer size of the fish would break him off far more often than the people fishing around him. By using a longer, and softer rod, there was far less tension placed on the leader line. Ben started to realize that his spinning reel wasn’t the ideal tool to be catching fish with under a float. Using a spinning reel meant Ben had three steps to execute before the hook would set. First he had to close the bail, second he had to take up any slack line, and lastly he would lift his rod tip up to execute a hook set. By this point the fish generally had spat out the bait. Instead, the ideal tool for catching trout was to use what is called a centerpin reel. By allowing line to be pulled off of a spool with zero drag, Ben was able to let line out at the exact same speed as his float was drifting down river. No more, no less. When a fish took his float underwater, Ben was able to skip the first and second steps and go straight to setting the hook. Success. The following week, Ben began rummaging through his dad’s basement and found an old Fly Reel that needed some modification. Ben took the reel to his father’s shop to eliminate the drag components and get the reel to spin freely. That first experiment was enough to whet the appetite of the future inventor. The reel was a little small and far from perfect. Ben’s first outing had him fighting more line tangles than fish! Ben continued to follow his studies in Introductory Machining and Tool and Die, and he completed a 3 year apprenticeship in his factory to become a General Machinist. Ben’s dad encouraged him to earn his experience at another company. He eventually completed a 4 year Tool and Die apprentice program and continued on for an additional 3 years as the lead hand tool maker, building and designing progressive dies primarily for the automotive industry. In 1997, Ben felt it was time to make his move by either starting his own Tool Shop or by helping his father build the Machine Shop. So, one day Ben and his father were fishing in a Musky tournament when Ben asked, “How would you feel about me returning to the machine shop? ” Abraham’s response was less than enthusiastic, “You’ll have to work your way up again and start on the shop floor.” It’ll take a few years to rise to any managerial level. Obviously, Ben didn’t like the sound of that, but he felt it was the right decision and they agreed that he would come back to the company. Abraham’s Machine Shop had expanded its facilities to include Precision Sheet Metal Fabrication, and focused 95% of its resources to one sector: Telecom. They had one big customer that brought in the majority of their business. Ben innately knew that the plant couldn’t roll the dice on one customer. So throughout the next 19 years he embraced the role of Business Developer and attracted a plethora of new customers in multiple verticals including: Aerospace, Telecom, Automotive, Electronics, Automation, and Store Fixtures/Displays to name but a few. In 2005, Ben incorporated Abbecan Industries to continue Abraham’s legacy. Throughout the years, Ben had always had a vision to transform the machine shop from making products for others to making proprietary products for themselves. One consistent threat to a plant is the economic conditions in the marketplace. If there is a lull in production in the marketplace, as a whole, all plant production slows down. So, having their own line of inventory to produce would keep the plant operating at 100% capacity. Ben believed the plant had to have more than 1 stream of revenue at all times. This diversification in revenue streams would stabilize slow periods in the natural eco-system of production cycles. Fast forward to the winter of 2014, Ben is now in his 40’s and has accumulated over 30 years of technical experience. Basically, he could pretty much make anything out of metal. Still inspired by his first Center Pin Reel experiment, Ben had become an avid Center Pin fisherman. His knowledge of the metal world came full force up against his knowledge of Center Pin fishing, and he began some serious experiments to re-engineer and patent the Center Pin reel. Ben studied existing designs, quality, weight, mechanics, physics, tension, and all of the moving parts in a reel the same way a watchmaker would study a Rolex or a Patek Philippe. He found that the quality reels available for purchase all seemed to have circular clusters of holes to lighten the reel, but no real design or artistry about them. While art and beauty is in the eye of the beholder, he strongly felt that he could dramatically improve the esthetics. He then looked at quality: The industry was flooded with offshore cheaply machined or cast aluminum reels. Ben knew that he could improve both the precision and quality of the reel. He then wanted to solve the BIG problem with the Center Pin Reel. One day while fishing Ben had a catch on the line, but during the fight he had to climb over a moss covered rock and a fallen tree branch. With both hands on the reel he couldn’t pass the rod from his left hand to his right hand over the tree branch. He knew that if he let one hand go he’d lose the fish. It’s a difficult situation that many float fishermen occasionally find themselves in; trying to hold onto a catch in the middle of the river and having to navigate the treacherous current, uneven rocks, and trees. He didn’t have the free hand he desperately needed, that was his AHA! moment. What if he introduced a trigger system on the Center Pin Reel which offers a temporary drag option, allowing him to free up a hand. But could this trigger system offer the purists the luxury of an authentic Center Pin experience? Would the purists, like himself, want the option of pulling the trigger on the drag system in awkward moments such as these? While there were a handful of higher-end reel makers, they could only produce a handful of reels a year. Since these were one-man operations, they could not necessarily back a warranty or guarantee service if something happened to them. They could also only produce limited orders, and delivery time could span up to one year! As the owner of Abbecan industries, Ben has built an eco-system ideal for bringing inventions to life. 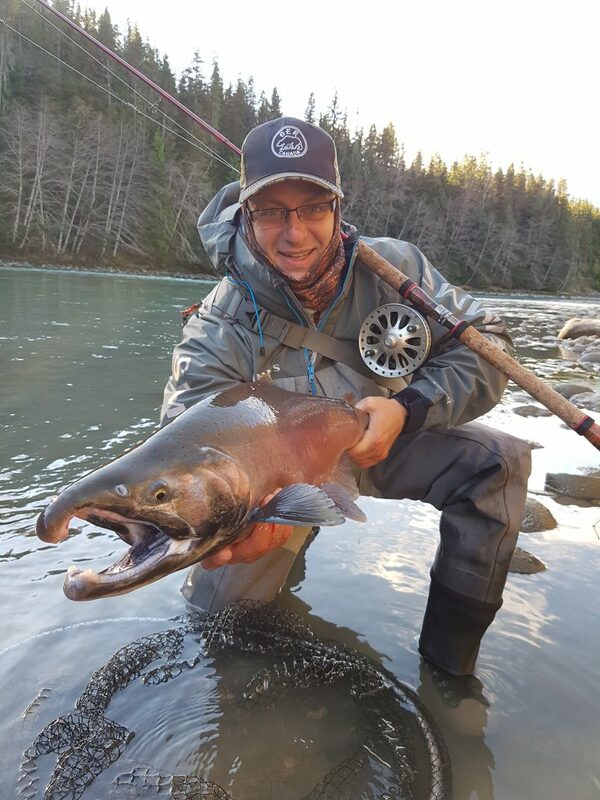 With access to ISO 9001:2008 certified facilities including the tools, the human resources, the research, and development budget, and combined with years of experience in precision skills and his love for fishing, Ben found himself in the right place at the right time. He continuously thinks of ways to improve on the existing designs and technologies of reels. From his first teenage experiment of machining his dad’s reel, you’ll still find Ben at the drawing board or on a precision machine working on bringing the next collection piece to life. BER Reels is a symbolic tribute to the bear, the most prolific fisherman of all. BR is also the initials of Ben Reubeni’s name. The company currently features a stunning collection of reels that include the Center Pin Reel with or without the drag system. The next generation of reels will include the Mooching Reel and Fly Reel. The BER designs are exclusive, and the improved mechanics of the reel are patented. BER Reels offers designs in limited edition for collectors. BER Reels offers designs precision crafted for retail in larger quantities. BER Reels are designed and manufactured in the Abbecan production facilities. They are committed to designing and producing the absolute best and most beautiful Center Pin Reels in the entire industry. One of the goals is to create a reel with effortless spin without any measurable decrease in its spin motion unless the angler intervenes. Test longevity, precision, stability, weight, friction etc. Apply drag full tension, measure how long it lasts, if there are any wearing on fasteners, bearing fatigue, measure pounds of pressure, stability, net force, friction, weight, etc. In 2017 BER Reels will introduce Mooching Reels and Fly Reels. Stay tuned for official release. Let me know when these come available to market. I may want one! Fill this out and we’ll let you know when these products become available! Do you have a Design Idea that you’d like realized? If you’d like to bring your product to market and need a facility to manufacture, contact Abbecan Industries for a quote. If you have a design idea for reels, rods, or any other related industry products we would love to hear it! However, before we’ll listen you must read and sign the Design Idea Release Agreement. You own the Design Idea. You have the full and exclusive right to submit the Design Idea to Abbecan Industries Inc. and no other person or corporation has any right, title, or interest in the Design Idea inconsistent with your rights to develop and license the design idea. If you are submitting the design idea on behalf of a corporation that owns the design idea, you have the authority to bind such corporation. Your design idea does not infringe upon or violate the privacy rights, copyrights, trademarks, publicity, or other intellectual or proprietary rights of any third party. Abbecan Industries Inc. has not made any promise or representation to you about the design idea, and has no obligation to use the design idea in any way. There is no agreement, written or oral, express or implied, between you and Abbecan Industries Inc. concerning the design idea, other than this release. Abbecan Industries Inc. does not accept any obligation of confidentiality with respect to the design idea. Abbecan Industries Inc. has the right to copy, use, and distribute the design idea for the purpose of its evaluation and review. You have kept a copy of the design idea. Abbecan Industries Inc. has no obligation to return the Pitch to you and is not responsible for any loss or damage to the Pitch. Abbecan Industries Inc. may have already and may in the future receive or independently develop materials similar to the design idea. Abbecan Industries Inc. has the unrestricted right to use these similar materials, and you will have no right or recourse against Abbecan Industries Inc. for use of these similar materials.